TBILISI, DFWatch–The Free Democrats has rejected a proposal by the National Movement to hold a snap election one year before the next scheduled one. UNM activists demonstrated Monday evening outside the residence of former Prime Minister Bidzina Ivanishvili against the detention of three young activists for assaulting a parliament member for the government coalition. During the demonstration, UNM announced a plan to launch negotiation with other political forces to hold a snap election. They didn’t specify which parties they plan to speak to, but only mentioned that any interested party will do. The Free Democrats has now ruled out supporting a snap election. The party was a member of the Georgian Dream coalition but withdrew in November, when party leader Irakli Alasania was dismissed as defense minister. Also the foreign minister and minister of Euro integration resigned in protest and are now active members of the Free Democrats. 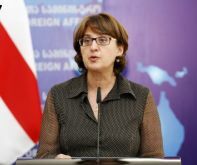 Maia Panjikidze, the former foreign minister, said Tuesday that the Free Democrats do not support holding a special election. She said there is indeed dissatisfaction about the government, but it is a signal for them to feel responsibility. However, she said, only one year is left until the parliamentary election. “This country, government, voters, political parties should get used to that there is a cycle which is crucial for the country’s democratic development,” she said, adding that it is important that there are normal conditions for conducting the election in 2016.